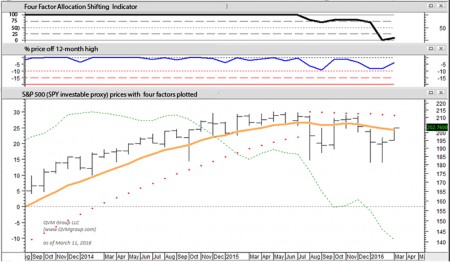 What use is close monitoring of stock market condition? For an investor who is determined to hold a static portfolio through good times and bad, the answer is not very much. For a young people executing a regular weekly or monthly investment accumulation program with many years ahead, bad news is good news, because they purchase more shares per Dollar of investment when the market is down than when it is up. In the long-term market downturns help them accumulate wealth. So they can ignore all this, unless they want to increase their periodic investments during market downturns. For investors in retirement who are not overfunded and who must sell assets for their standard of living, it is important to be aware or stock market conditions to decide which assets to sell to minimize the risk of rapid portfolio depletion, or to know when to minimize withdrawals to the extent possible. Then for others who wish to tactically modulate their asset allocation in response to and to potentially profit from changing stock market conditions, this stuff is very important. For those of our clients, this market condition information is useful. For example, an investor with a long-term 50/50 stock/bond policy allocation, but with a collar around that policy level of say a more defensive 40/60 to a more aggressive 60/40 allocation, this information could be used to decide when and how to modulate. Let’s call that allocation shifting, where the allocation revolves around the target level based on market conditions. It could apply to any target policy allocation with collars; such as an aggressive 80/20 stock/bond long-term target with a 70/30 to 90/10 range; or a 30/70 with a 20/80 to 40/60 range. 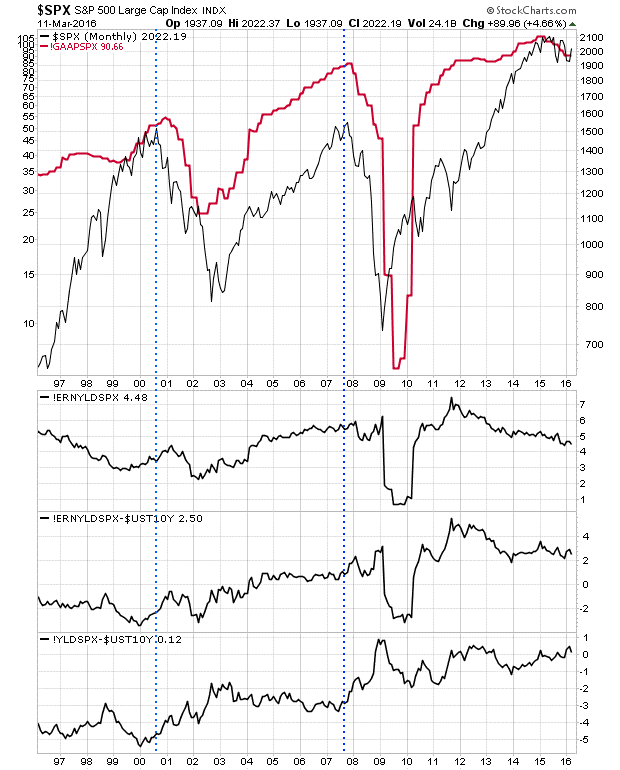 This first chart is our monthly “Allocation Shifting Indicator” (the bond black line in the top panel) which rates a market from 0 to 100 for condition where 0 is very weak and 100 very strong. 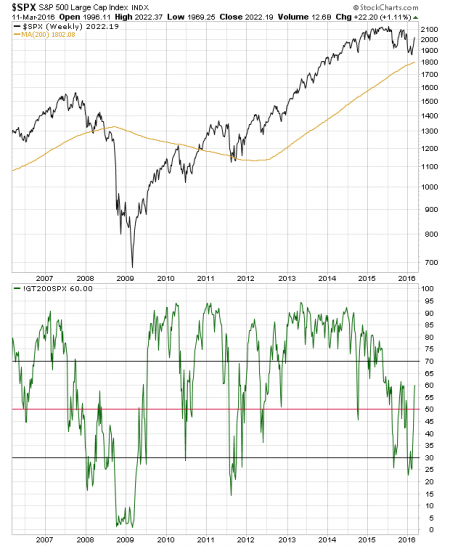 When the indicator is at zero, a more defensive posture is suggested, which for that investor would be 40/60 stock/bond. 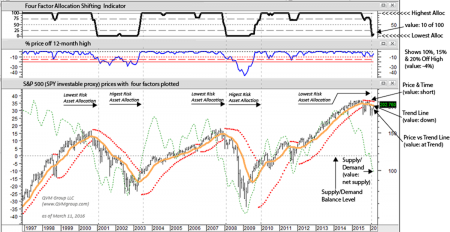 At an indicator reading of 25, a less defensive posture of 45/55 might be appropriate. When the indicator is at 75, a more aggressive 55/45 stock/bond allocation is suggested by the indicator. Then when the indicator is at 100, the maximum risk level within that particular investors investment policy would be called for at 60/40 stock/bond. The same logic would apply to any investment policy target allocation, and to any magnitude of more defensive and more aggressive range endpoints. With all that said, let’s dive into the allocation shifting indicator. 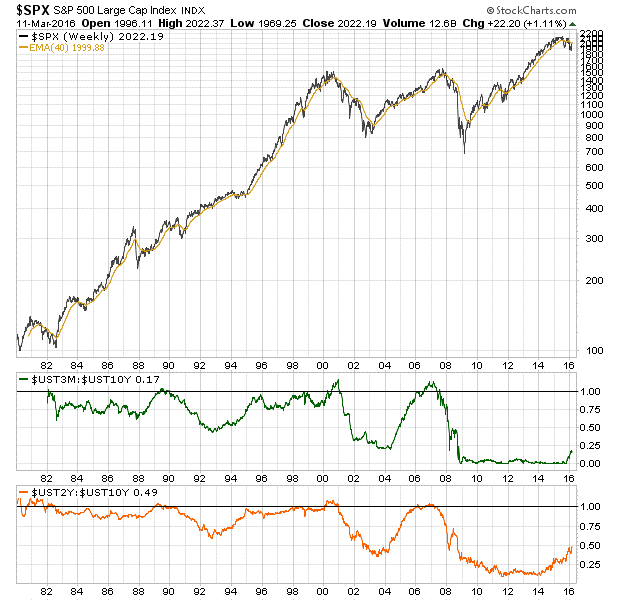 You can see with this price chart for SPY (an investable S&P 500 proxy) spanning two major tops and two major bottoms (lower panel), that the indicator (bold black line in top panel) reached a zero reading in time to save a lot of pain and lost money in 2001 and 2008. 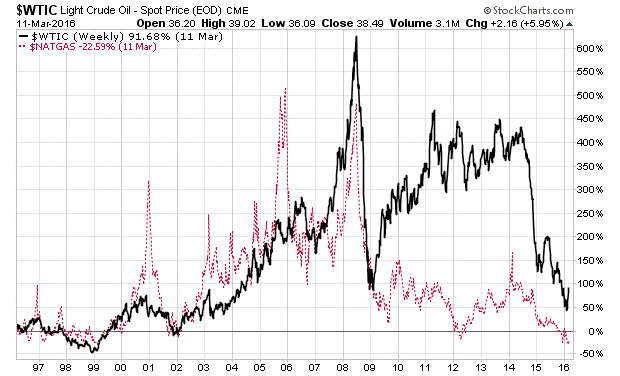 It also did a decent job to suggesting a profitable re-entry (or increased risk allocation) with a 100 reading in mid-2003 and the end of 2010. 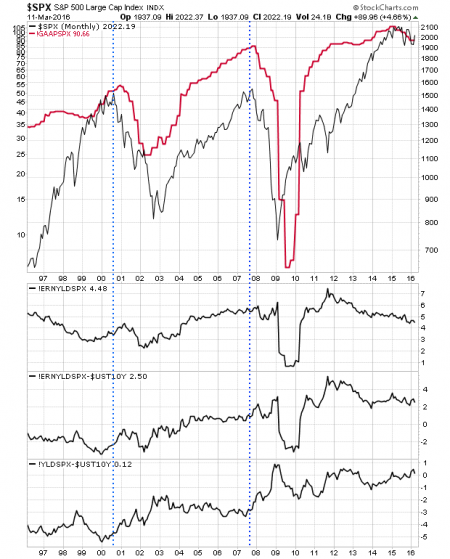 You will also notice that as the indicator moved from zero to 100 (and from 100 to zero) it passed through intermediate levels that suggested phased reduction and increase in equity risk. As of the end of February, the indicator suggested defensive positioning, with a reading of 10. Here is a zoomed-in view of the monthly indicator. The middle panel with the blue plot line and red horizontal lines shows the percentage the price is off of its 12-month high, so you can compare that to the signals from the indicator. 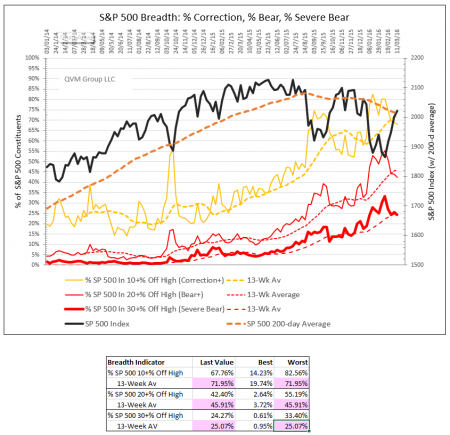 This month-end indicator did not predict the August 2015 Correction and basically followed the market down with reduced equity exposure as the market deteriorated. If the trend is actually down, however, it would have the investor positioned defensively. You can see that it is the largest companies that are holding up the market, while the smaller company prices are struggling. It is human nature to anticipate, so even though we think monthly data is best used most of the time, we cannot resist trying to peak around the corner to see what may be coming down the path in the current month by examining weekly data. 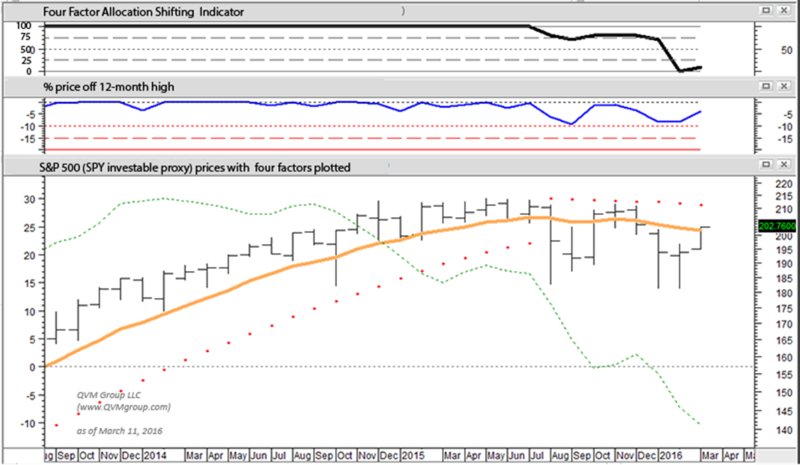 So far, the weekly data for the S&P 500 has the same defensive suggestion with a reading of 10 for the indicator. 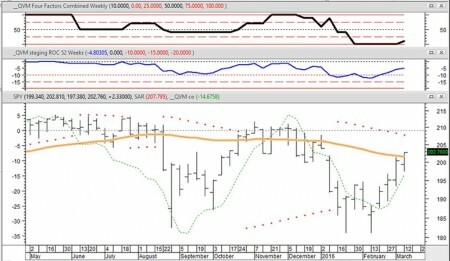 You can see that the weekly indicator did “sense” a problem and suggested a 75% risk level just before the August Correction, but it also got “whipsawed” a bit by the subsequent rally. At this point it is suggesting the current rally has not proved itself to be sustainable yet. The allocation shifting indicator, which is at the index level, may not be sufficient to tell a full enough story. So let’s go inside the index and look at what its constituents are doing to help us interpret the market condition with perhaps more advance warning or notice of developing changes. 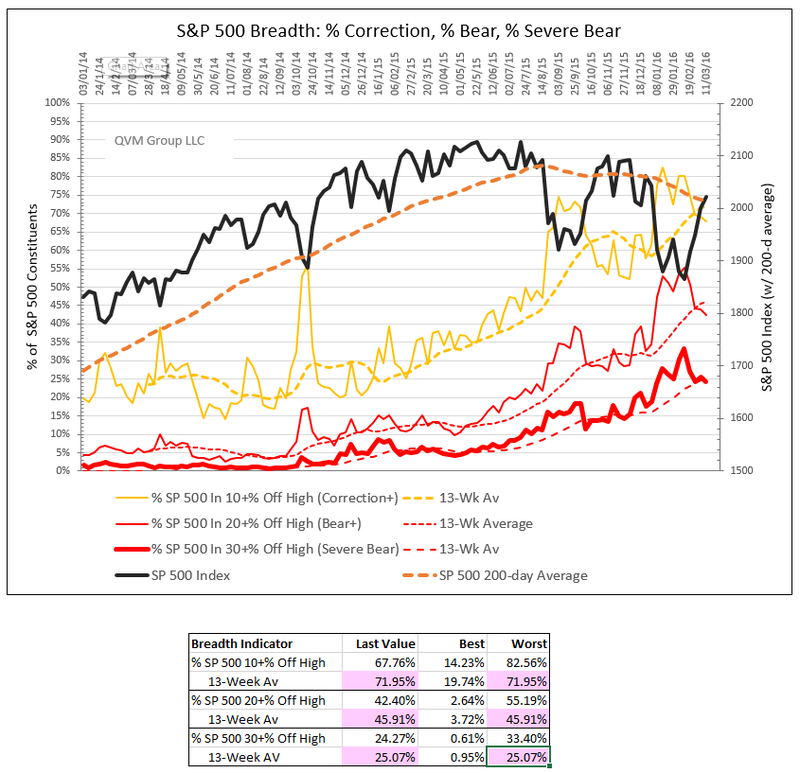 This chart plots the S&P 500 index and its 40-week average in black and dashed orange, and also the percentage of the S&P 1500 index constituents that are in a 10+% Correction or worse; a 20+% Bear market or worse; and a 30+% Severe Bear market or worse. As you can see from the chart and the table of values below the chart, the great majority of constituent stocks are in pretty tough shape – more than 2/3 in Correction or worse, 40+% in a Bear market or worse; and 24% in a Severe Bear market or worse. 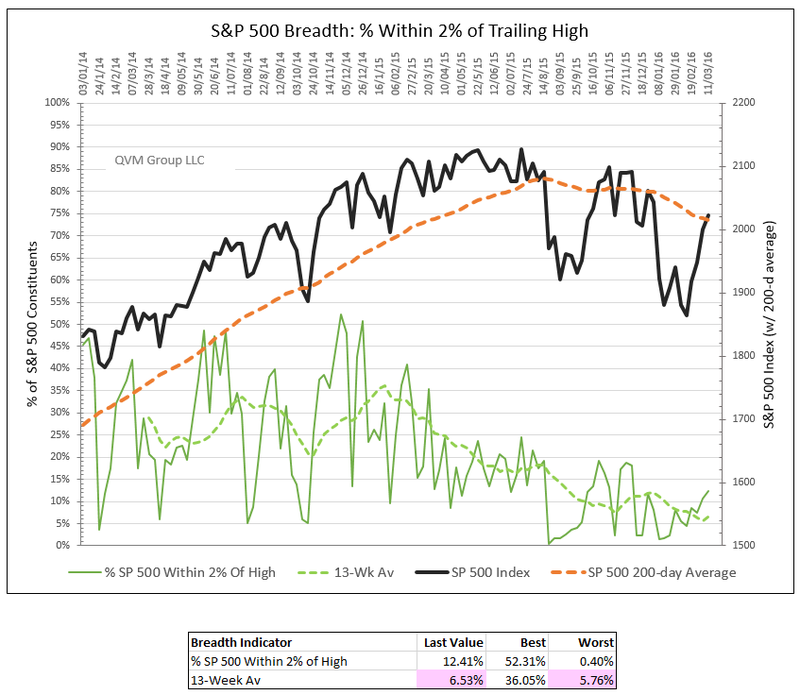 This chart also plots the S&P 500 in black and orange, but also the percentage of S&P 1500 constituent stocks within 2% of their trailing 1-year high. Before the August 2015 Correction about 1/3 of stocks were within 2% of their high, but now only about 12% That shows continuing thinning of the leadership. A straight forward ratio of the performance of stock indexes can also show the weakness of the broad market. 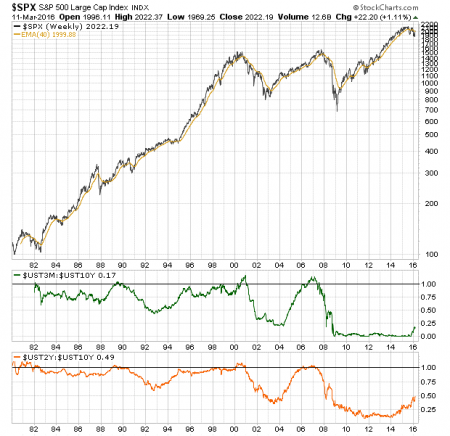 This charts plots the ratio of the S&P 500 equal weight index (RSP) to the S&P 500 market-cap weighted index (SPY). The declining line shows that the lower average size constituent of RSP is underperforming the larger average size SPY. That is weakening market breadth. 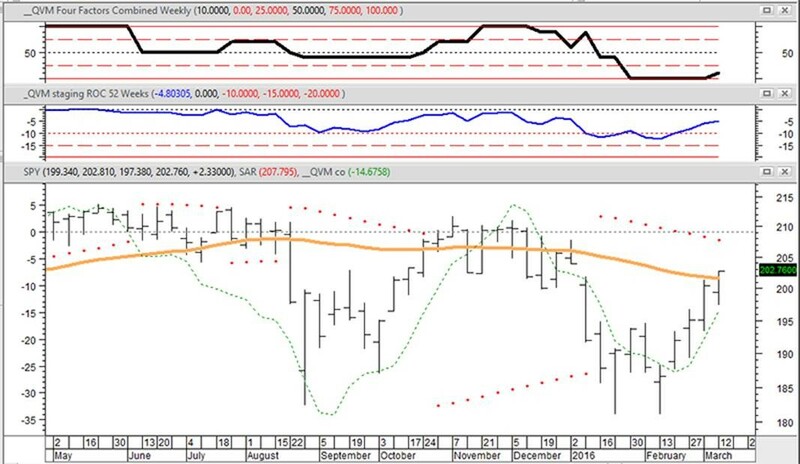 More dramatically, this chart plots the ratio of the Russell 2000 index (IWM) to the Russell Top 50 stocks (XLG). 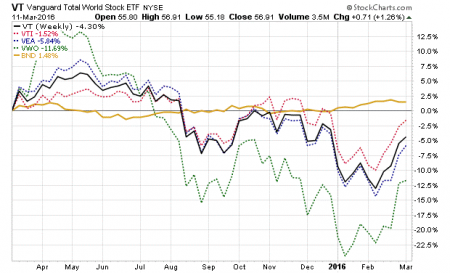 The small-caps have been underperforming for many months now; showing that the largest stocks are driving the market while overall breadth is poor. On the side of continued caution is this 10-year weekly chart, which plots the percentage of S&P 500 stocks that are above their 200-day moving average (60% at this point). That is better than less than ½, but still well below the 70+% levels that characterized the pre-August Bull phase. 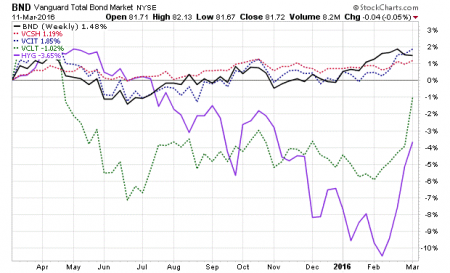 Consumer Staples and Utilities are yield oriented sectors that are overbought in the scramble for yield. They are competitively vulnerable to eventual rising interest rates. Energy is still very much in the dumps. Shifting over to fundamental indications, we see (pink shaded area) that the operating earnings growth forecast for 2016 has been reduced significantly since the beginning of the year — 2.7% growth is seen now versus 6.8% as of December 31, 2015. 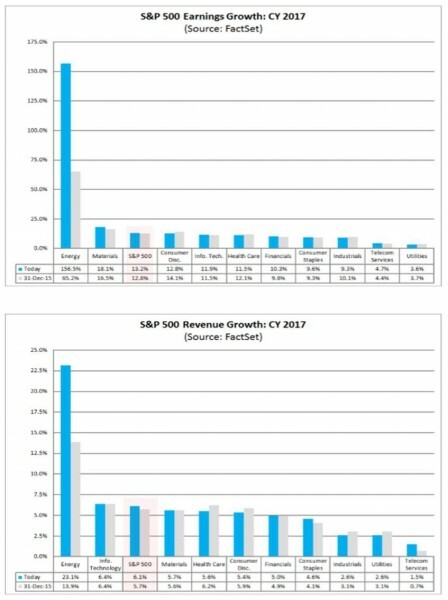 And 2016 revenue growth expectations have declined from 4.3% to 1.6%. Those are big adjustments, with a negative tilt. As is typical on distant projections, 2017 is forecasted to be much better, with energy profits roaring back, contributing to a small upward earnings growth adjustment from 12.8% to 13.2% from December to now. Likewise, the upward adjustment to revenue expectations is mild going from 5.7% to 6.1%. Importantly, reported GAAP earnings have been falling for several quarters now (the red line in the chart). You can see from this chart that in the past when reported earnings declined, so did stock prices. Unless reported earnings pick up it is not reasonable to expect must price improvement. 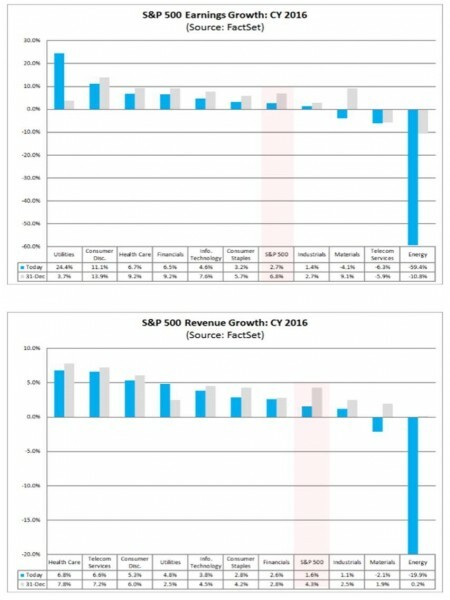 With declining earnings forecasts, it is hard to get too excited about stock prices. 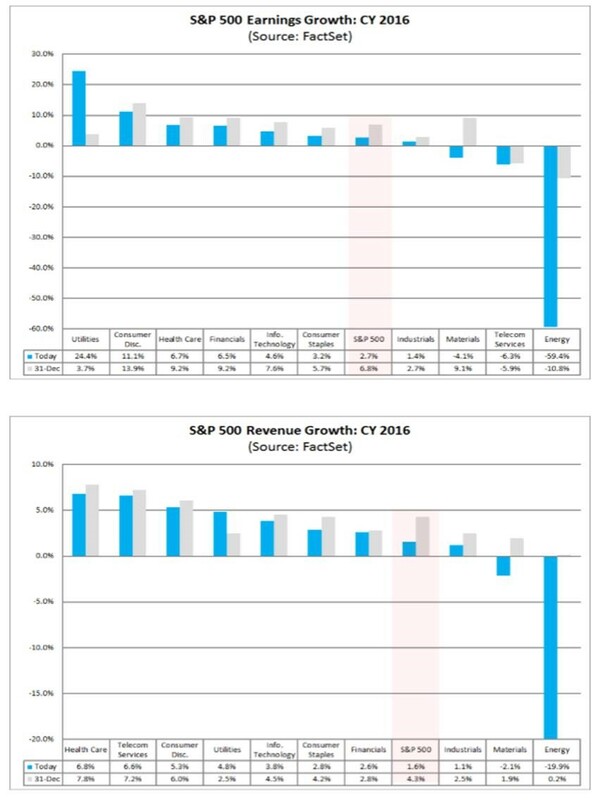 For background, the bottom three panels present in order top to bottom: S&P 500 earnings yield (inverse of P/E); S&P 500 earnings yield less 10-year Treasury yield; and S&P 500 dividend yield less 10-year Treasury yield. Those are all competitive levels in this low interest rate environment, which may limit stock market downside potential. The yield curve is an important economic driver, predictor of recessions and booster or killer of Bull markets. When short-term Treasury yields approximate or exceed long-term rates, the curve is “flat”, and economic activity is suffocated (bad for stocks). When the short-term rates are much lower than long-term rates, the curve is “steep” and economic activity is typically stimulated (good for stocks). This chart shows the ratio of the 3-month yield to the 10-year yield (green) and the ratio of the 2-year yield to the 10-year yield (orange). While the curves are not as steep as they were a few years ago, they are still stimulative, and good for stocks. This is one important pillar of support for stock prices, that may limit stock declines. The yield spread between Moody’s BB rated (higher rated junk bonds) and comparable maturity Treasuries rose a lot over the past year, and was part of the worry contributing to the stock Correction. 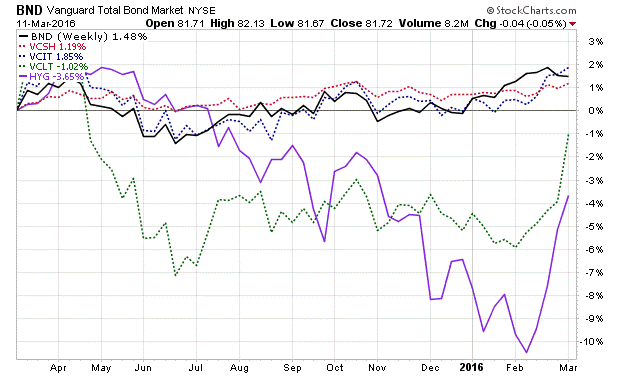 Very lately, however, the spread has narrowed lot, which is a good sign for stocks. This chart of the financial system stress levels from the St Louis Fed and the Cleveland Fed (covering lots of debt market, stock market and real estate market dimensions) have shown rising stresses, which is not good for stocks. The American Association of Individual Investors Bull/Bear ratio is about 50/50 Bulls and Bears. No help there either way. Flow of money into and out of stocks and funds is also an important factor to consider. 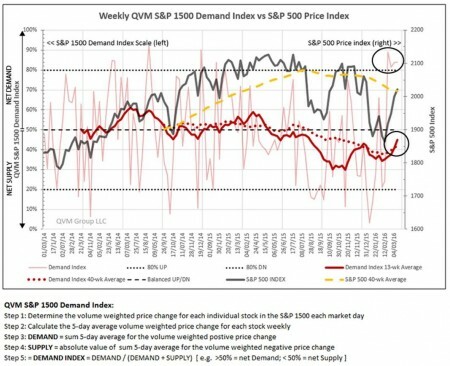 This chart plots our weekly Demand index for the S&P 1500 stocks (in red) versus the price of the S&P 500 index (in black and orange). This demand index shows net demand (net buying) when the value is greater than 50 (left scale) and net supply (net selling) when the value is less than 50. 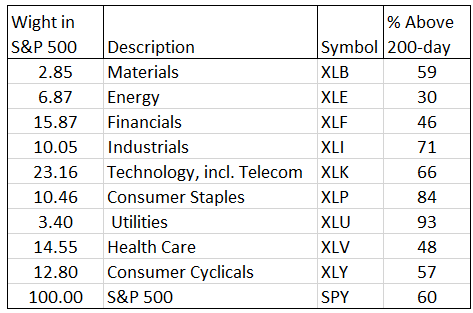 We calculate this index by considering the weekly price change of each stock in the S&P 1500 and the volume of shares traded in each stock during the week (formula provided below chart). 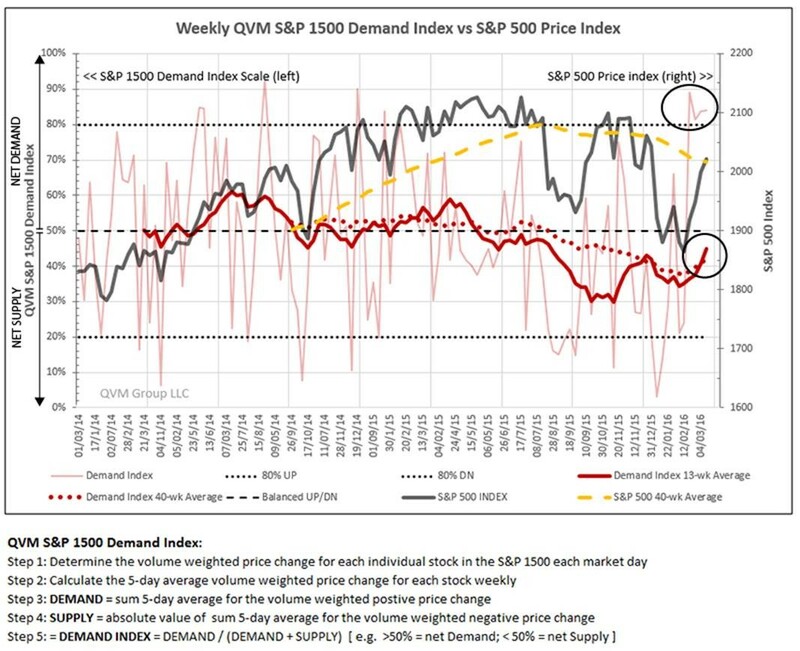 You can see the index went from Net Demand to Net Supply a few months before the S&P 500 August 2015 Correction, giving some advance warning. The last 3 weeks have seen very strong Net Demand (upper circled area), but the 13-week and 40-week average demand is still negative for the broad market (lower circled area). This measure is inconclusive at the moment. 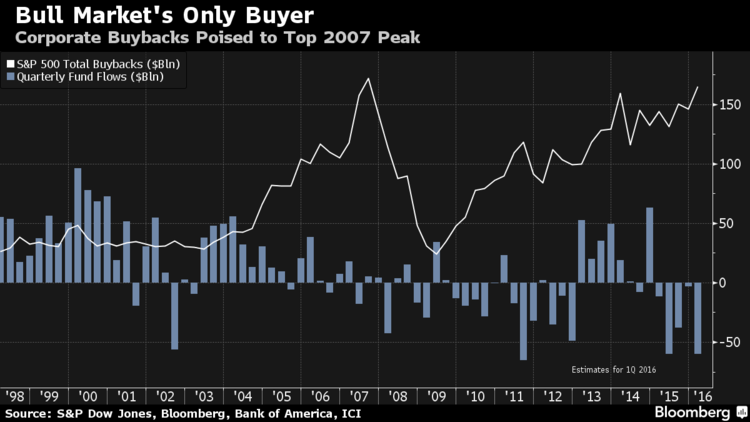 An important analysis of the contribution to demand came from Bloomberg today, in which they pointed out that investment funds have had a net negative flow of money for the past 5 quarters, and only due to corporate stock buybacks did the demand stay positive. Important risk comes from the possibility that corporations may be approaching a full stomach on debt, and that the cost of servicing debt may rise in the near terms, and that corporate earnings decline further. If those factors were to significantly slow corporate stock buybacks, the impact on stock index prices would probably be strongly negative. 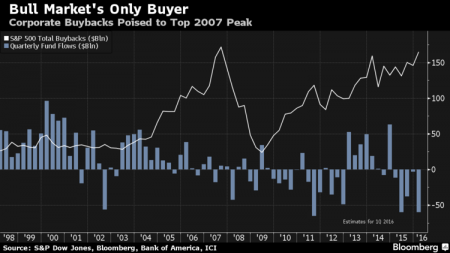 Buybacks may not decline until the next recession as they did in 2008, but their behavior needs regular observation. 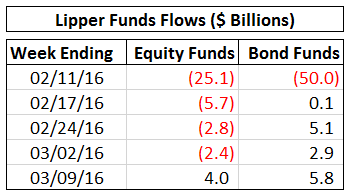 A short-term look at registered investment fund flows looks like this. Over the past 5 weeks, equity funds have had net negative flows, until last week, where it appears investors began chasing the current rally. Given the lag in retail investor decisions, that flow may continue for a few weeks whether or not this rally continues or fades. 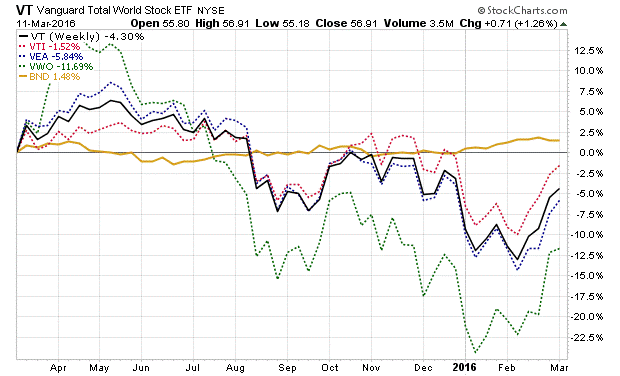 This 1-year, weekly chart of world stocks (VT), US stocks (VTI), developed markets stocks (VEA) and emerging market stocks (VWO); as well as aggregate US bonds (BND), shows the rally is global, but so far has not achieved a net positive return over a 12-month period. 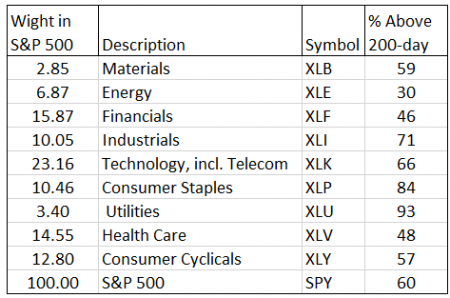 US stocks are in the best shape. Emerging markets are in the worst shape. This 1-year chart of US corporate bonds versus aggregate US bonds (which include Treasuries) shows long-term corporate bonds (VCLT) and high yield bonds (HYG) are in net negative return, but have undergone a strong rally in the past few weeks. Intermediate-term corporate bonds (VCIT) just edged out aggregate bonds (BND), and short-term corporate bonds (VCSH) are also positive and not far behind intermediate and aggregate bonds. 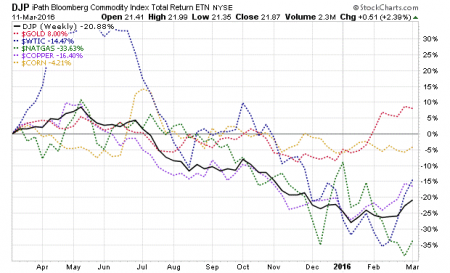 In the commodities space, gold has had a solid rally from about negative 8% to about positive 8% during the stock Correction, but has leveled off during the stocks rally. With interest rates low, and if the S&P 500 enters a new Correction or a Bear, gold may well continue its rise. Some key analysts, such as those at Goldman Sachs, still think gold will decline to or somewhat below its 2015 lows. 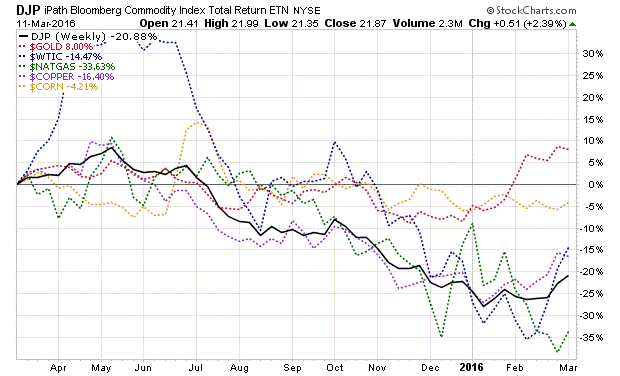 Corn (a key ingredient in the making of both foods and fuels) is the second best performer at negative 4% over a year. Natural gas is the worst performer at almost negative 34%. We hear a lot about oil prices, but natural gas is worse over the past years. Oil is down only 14+% over a year, after a big rally (we think a head fake) based on talk between Saudi Arabia and Russia about limiting oil production at current levels IF others will do the same – that appears unlikely, and Iran has said as much for their production. Copper has rallied too, but is still down over 16% for 12-months. Abundant natural gas has kept its price low for years, the relatively recent fracking industry achievements have created an abundance of oil that has brought its price down too. 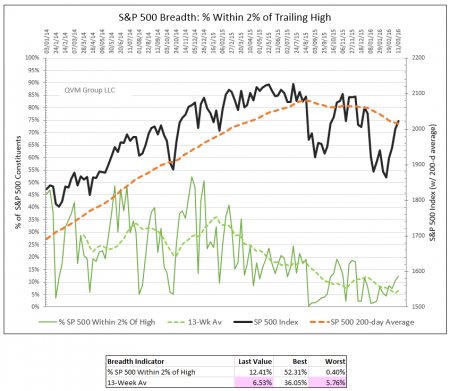 Taken altogether, we are still in the Bearish camp, until breadth improves at a minimum. For our clients with stocks and bond portfolios, we recommend being at the more defensive end of their investment policy range. For clients with stock only portfolios, we recommend being nor more than 50% invested, and then only in solid, high quality core positions. For investors who are young and making regular periodic investments, we recommend equity only and continuation of accumulation in whatever mix of domestic and international stocks is in their plan. Feel free to call and discuss as this pertains to your specific circumstances and portfolio. This entry was posted on Monday, March 14th, 2016 at 11:11 PM and is filed under market outlook. You can follow any responses to this entry through the RSS 2.0 feed. Both comments and pings are currently closed.